In 1963, Erik Bulatov began signing his works. This was the beginning of the independent artistic career that followed the period when he mastered the experience he had gained from Robert Falk and Vladimir Favorsky. In his paintings from the early sixties, among which is Three Surfaces, Bulatov investigated the surface of objects on the picture plane. For him the picture was not only a visual medium but also a “living organism,” in dialogue with which he could grasp the reality around him. At this time, Bulatov perceived the world as “an infinite number of surfaces”. He discovered that any object consists of surfaces that succeed one another. “Exposing one surface, we always encounter another surface, but something compels us to see what is behind each of them, as if the cause for the existence of these surfaces is concealed within them.” For Bulatov, even the sky was imagined as a dome, a vault – that is, as the surface of something. In Three Surfaces, several shapes are superimposed on each other and move towards us. 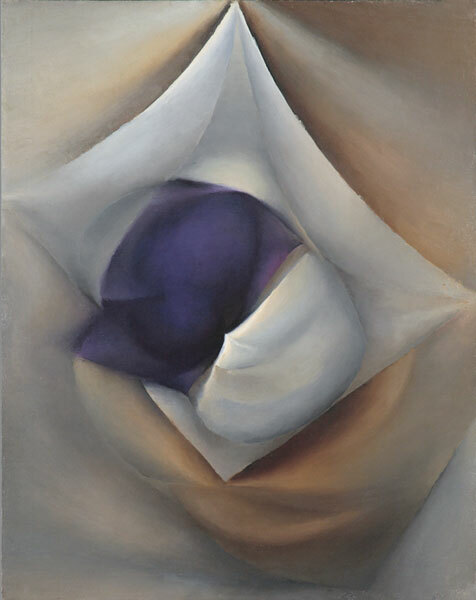 In the geometrical center of the abstract composition we discern two shapes, one white and one purple, placed on top of another white, unevenly rectangular shape. Three points of this rectangular shape touch the edges of the painting, while the ocher background, on which all three shapes are placed, extends beyond the picture on all four sides. The colors are applied in chiaroscuro so as to suggest areas of shadow and light, thus creating an illusion of volume and three-dimensionality. We are therefore inclined to read the composition as a still-life. The objects depicted are, in fact, several sheets of paper, that are partially crumbled, pleated or spread out flat. In order to be able to concentrate on the representation of relatively flat surfaces, rather than of deep, receding space, the artist chose to represent his subject matter viewed directly from above, as opposed to from the side. We get the impression these sheets of paper have a life of their own: that they are set in motion by something within them. But the cause of this motion is incomprehensible and invisible to us because it lies underneath the surface. We see only the relationships of surfaces that arise as the result of these invisible processes. The metamorphosis that occurs in Three Surfaces could happen to any object if we stare long enough at it, singling it out from the mass of other objects. Fixing our gaze on any ne of them, we impart to it a particular, individual character, while everything else becomes secondary. In the same way, we single out the white and purple shapes from the ocher background, differentiating them from everything else around them. The background itself, although it is a vibrating surface, rather dissolves under the swelling surfaces of the sheets of paper, which first and foremost are objects with a surface that distinguishes them from the infinite space around them. At the same time, they have their own volume, which likewise contains fragments of space. Already in this painting we see evidence of Bulatov’s meditation on space, which were subsequently to become one of the main elements in his works. In this painting, however, space is manifested in connection with the need to investigate the surface. It turns out that the surface needs space in order to avoid remaining a lifeless plane. Thus, in the painting, two-dimensional planes are converted into a three-dimensional image. The illusion of space generates a relief that moves towards us: the image is not directed into the interior of pictorial space; instead, it turns outward and towards the viewer, trying to break away from the plane. The relation of object to space that Bulatov investigates in this picture is conditioned by the very process of the object’s emergence. During the period when he worked on Three Surfaces, he attempted to explain, in the article “The Beginning” (1963-64), the basic artistic tasks he had set himself: “The object’s birth in space is an event extended in time. I try to make a reverse journey in time, to figure out how the object emerges, to get back to the initial impulse that set space into motion.” For Bulatov, this impulse is the energy of light, whose source can be either the object depicted in the painting or something out of sight. But in either case it is the main cause of the object’s appearance on the picture plane. The energy of this light is concentrated in the picture’s center. It almost appears as if an inward light is emanating from the objects, a light that Bulatov captured in a variety of subtle shades in order to give life to these objects.